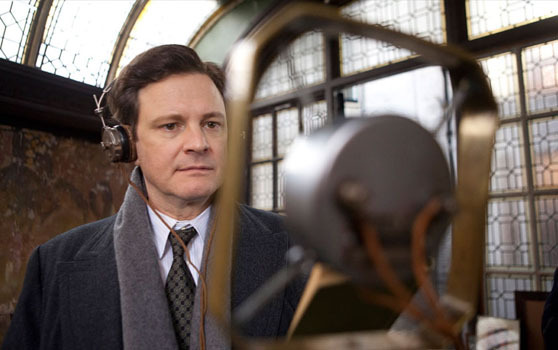 On the face of it, there isn’t much to link Tom Hooper’s The King’s Speech and Darren Aronofsky’s Black Swan. The former is a solidly written and acted historical piece, made in the efficient but workmanlike style that characterises many British period films. The latter is a visually showy, full-blooded melodrama that is almost too imaginative for its own good, careening from psychological thriller to B-movie horror to profound study of artistic turmoil. But the two movies do have something in common: both feature lead characters suffering from serious performance anxiety as they prepare to don a role. Colin Firth and Natalie Portman may have been Oscar royalty for a night, doing and saying all the right things up on that podium, but they won their statuettes for playing a nervous (real-life) king and a mentally fragile (Swan) queen respectively. 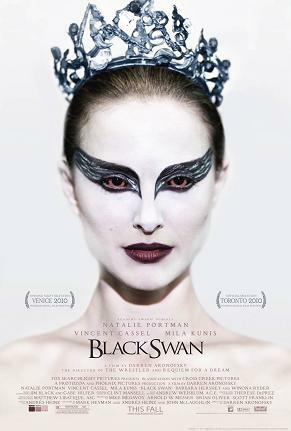 In a way, therefore, both stories are about performers putting on a face, and one thing both films do well – Black Swan in particular – is to place us in the middle of the action. Needless to say, this is a position we aren’t accustomed to being in when it comes to such things as royal speeches or ballet. Whether in person or watching on a TV screen, we see such “shows” from a comfortable distance, from a position of detachment. But Black Swan contains many handheld camera shots that take us right onto the stage with the tormented Nina and the other dancers – so that we get a sense of them as real, vulnerable, hardworking people with creaking joints and bruised feet, rather than as automatons striking poses on a faraway platform. And one of the very few times The King’s Speech does something relatively unconventional with its camera is in a tracking shot that follows Albert into the hall where his coronation ceremony will soon take place. From our vantage point right behind his head, we can feel the full magnitude of what awaits him, and this makes the subsequent point-of-view shots more effective; that intimidating portrait of Queen Victoria is frowning at us as much as at him. “I was perfect,” Nina whispers in the final seconds of Black Swan, though we’ve already seen at what cost this “perfection” has been achieved. 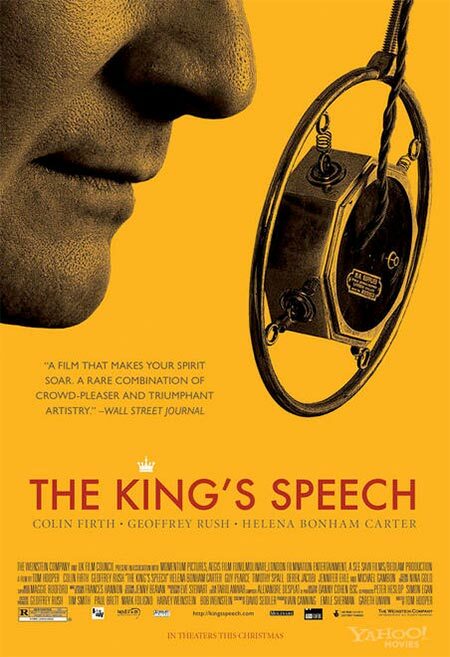 The climactic sequence of The King’s Speech – with Albert delivering his radio address to the country on the eve of the Second World War – is more subdued; it’s about stiff-upper-lip pragmatism rather than the heady intensity of a ballet reaching its crescendo, and the speech itself is not perfect – merely good (which is more than satisfying, given the lead up to it). The two “theatres” couldn’t be more different, but both end with a sense of personal affirmation for the “performers”. In that sense, there’s something poetically apt about the acting Oscars going to Firth and Portman this year, whether or not you agree with the decision. P.S. Black Swan is, of course, open to dozens of other interpretations. I’m sure someone will eventually write a thesis about the whole film being an elaborate metaphor for sexual awakening/the loss of virginity – what with Nina being “pierced” by a phallic shard in the climactic scene, and the liberating effect this has on her. More seriously, it has visual and thematic similarities to Brian De Palma’s Carrie, in which a disturbed, virginal girl (with a psycho mother) unleashes forces she didn't know she possessed. Both films also feature climactic scenes involving white dresses being stained with blood – you decide what that might mean! I was wondering why there was no activity on your blog about the Oscar favs - am glad you wrote this post. You know when I think of The King's Speech and The Black Swan, I see extreme contrast ( probably stating the obvious) - but there is something clean and dignified about the Kings Speech which sort of incites positive emotions - empathy, sympathy, hope. Vipula: no surprises there - I don't watch contemporary cinema on a regular basis, and haven't really been following the Oscars (or other competitive awards) for a few years now. That said, at a friend's request, I did this short piece on The Social Network for the Hindustan Times' Oped page countdown to the Oscars - it's basically a condensing of my earlier post about the film. 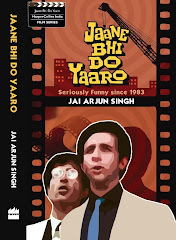 But it was annoying when they put "Jai Arjun Singh on his favourite best picture nominee" on the masthead, given that I hadn't seen any of the others at the time! And yes, there are of course more differences than similarities between The King's Speech and Black Swan. I was just engaging in an exercise I sometimes find rewarding - looking at something that two films have in common and using that as a take-off point for more general commentary. Jai, where did you have these "conversations about the perils of sub-textual analysis"? Rahul: oh that was said partly in jest, but I do very often have conversations about "reading too much" into a film, "seeing things that aren't there", and so on. Many of these have been with Baradwaj Rangan - he often gets accused of over-analysis by people who have very straitjacketed notions of what a review should be. Also see the comments space here. Man I saw and loved both movies and the similarities that seem so obvious now totally missed me - thanks and bravo. I got to see you interview Ms. Kiran Desai and almost came up to say hallo a few times, but you seemed harassed and flustered, so I decided against it. In any case next ooportunity I get I will convey my appreciation for your fine blog in person. @JAI : i love this blog !!! woo hoo - i am so happy , i have this subscription now , some meaningful adn enjoyable emails in my inbox now. that said, i though , black swan , was amazing !! though the entire winona ryder episode seems a tad bit overdone . but portman , is really really good. hellena bonham has hardly been used in the movie though , dont you think ? she's got such an interesting johnny depp-ish side , which i guess would have been completely wasted in a film like king's speech . colin firth though , the eternal darcy in my mind , was brilliant . however - both movies, fail to inspire in me , in a way i would expect them to , such is the hulla about them. you know , something like a beautiful mind , or even an inception -- which by the way, i have no clue did not win as much as it deserved to. Thanks for the link Jai. I have also had quiet a few conversations on the topic,and I have come to the conclusion that its hard to convince someone about the subjectivity of appreciation of any kind of art- it takes an "a-ha moment" that comes on its own. "While the crew was applying blood to the stab wound on Natalie Portman, she commented to director Darren Aronofsky that she was uncomfortable with the placement of the blood on her tights because it looked like a period. Aronofsky told her he intentionally placed the blood where it was to symbolize Nina becoming a woman. As a result, Portman has stated that she doesn't believe Nina dies at the end of the film. She sees it more as Nina having to kill the little girl in order to mature into a woman."